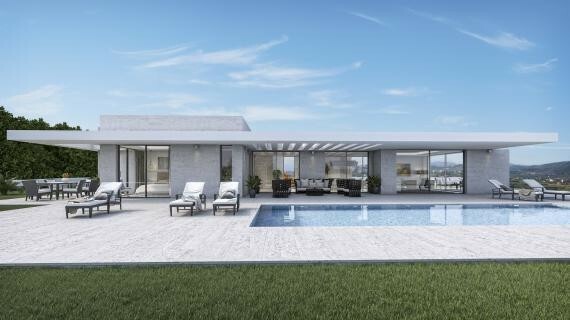 This stunning Villa was designed for an exclusive plot in Monte Olimpo, Jávea, one of the most beautiful areas in Alicante.The privileged location and the unique design of the house allow us enjoy fantastic sea and valley views. This modern and original house is just 8 minutes driving from the beach and the shopping area of Arenal with shops and boutiques for all ages and restaurants serving Mediterranean food. This exceptional property has a total area of 163 m2 facing northeast and sits on a 1000m2 plot. The house is distributed over two ﬂoors. On the main ﬂoor, there is a large living-dining room with a modern integrated fully equipped kitchen, a guest bathroom and one more bedroom with en-suite bathroom. This area oﬀers direct access to the outdoor terrace, with an Inﬁnity pool, and beautiful panoramic views to the Montgo Natural Park and the sea in the horizon. On the ﬁrst ﬂoor of this Villa there are two bedrooms in suite with integrated wardrobes. The master ebdrooms has access to a nice terrace with beautiful views. 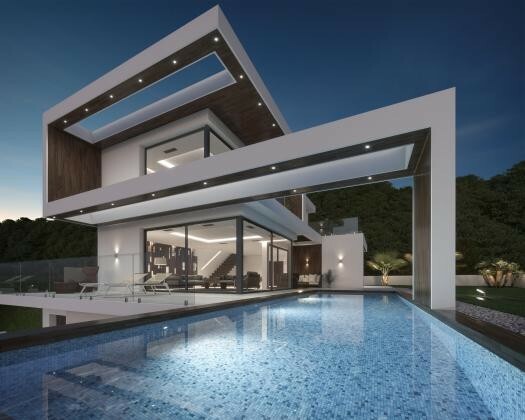 The villa was designed with high quality materials and the best ﬁnishes. A beautiful garden surrounds the house, creating a perfect place to relax and enjoy.